After years of delays due to budget and contractor related issues, work finally began to complete the restoration of the historic cast iron fence that surrounds Stuyvesant Square Park’s east section. Starting late last month, large sections of the landmarked fence were hoisted in via crane as were the fence posts, which were placed temporarily on the lawn. At some point in the coming months there will be a ribbon cutting, but in the meantime, the construction itself is something to celebrate for community activists who’ve been pushing for this project’s completion for 20 years. A tree branch that at its lowest point hovered six feet away from the ground was cut off on Tuesday, following a tragedy earlier in the week when a woman was killed by a falling tree in a Queens park. The left circle shows a weakness in the branch while the right one is the tree’s lowest point. Following a horrific incident of a tree falling over in a park in Queens, killing a pregnant woman last Sunday night, on Tuesday, the Parks Department cut down a large branch on a tree in Stuyvesant Square Park that had been hanging dangerously low since the winter. It was local tree advocate Michael Alcamo who’d noticed that the branch, which was around 30 feet long and on a tree that’s located near one of the park’s east side entrances, was becoming a potential hazard. Two weeks ago, Alcamo, a resident of Stuyvesant Town, reported the problem to the Parks Department, where a rep thanked him for the heads up and said the alert had been sent to a forestry director. However, as of Monday, the park branch remained hanging lower than ever, Alcamo said. After being contacted by Town & Village for comment, a rep for the department, Philip Abramson, responded the following day to say that the tree limb had been removed. Abramson added that some other pruning work was also done in the park. Meanwhile, Alcamo, who’s convinced the city to plant over 300 street trees around the Stuyvesant Town and Stuyvesant Square areas in recent years, has also always been vigilant about checking on the status of street and park trees, seeing if they need water or attention for other reasons like pedestrian safety. In his letter to Parks Borough Commissioner Bill Castro, dated July 25, Alcamo made mention of the fact that an incident not too dissimilar from the tragedy in Queens had also occurred in Stuyvesant Square Park. It was six years ago, he noted, when social worker Alexis Handwerker, who’d been sitting in the park, was badly injured when an oversized tree branch came crashing down on her. After five years of litigation, in February, 2012, Handwerker finally reached a settlement with the city for $4.1 million. As for the tree in Queens’ Kissena Park, when it came down, it almost immediately killed 30-year-old Chinese emigrant Yingyi Li. In a New York Post article on her death, park goers and State Senator Tony Avella put the blame on a lack of maintenance for the park’s trees. Alcamo suggested that Parks employees make it a monthly task to check which park trees could use pruning, specifically for safety reasons. In response, Abramson told T&V that the park is inspected “regularly for any potential tree concerns.” There was no response to a question of how the tree ended up falling in Kissena Park. 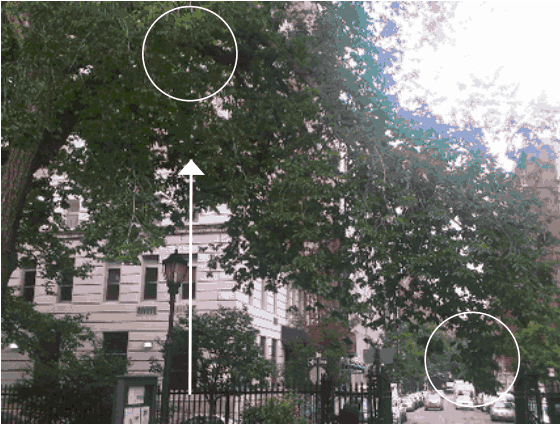 Alcamo said he believes the tree in question at Stuyvesant Square, an American elm labeled number 162, was weakened over the winter due to having snow and ice pile onto the branches. The low hanging branch was not far from the entrance that’s close to the emergency room at Beth Israel. It’s heavily used by hospital employees as well as parents walking their kids to the nearby Jack & Jill nursery school. Stuyvesant Square Park, located between 15th and 17th Streets and separated into two sections by Second Avenue, is maintained by the Parks Department. The Stuyvesant Park Neighborhood Association members as well as other volunteers also help oversee the park. Recently, Alcamo founded a group he calls Friends of Stuyvesant Square Park, and said he plans to recognize groups and businesses that support the park along with other local efforts.